I recently received my Duet Ethernet and have been wiring it up to my printer and PSU using the wiring diagram on the wiki, (the link being: https://duet3d.com/wiki/Duet_WiFi_and_Ethernet_wiring_diagrams). I just finally finished wiring the board fully today and tried to start up the PSU and then heard a weird/bad noise in which I immediately turned off the PSU ASAP as I realized it seems I had wired the board wrong, sadly. The diagram on the Wiki is incorrect, as the "power in" wiring is actually switched. 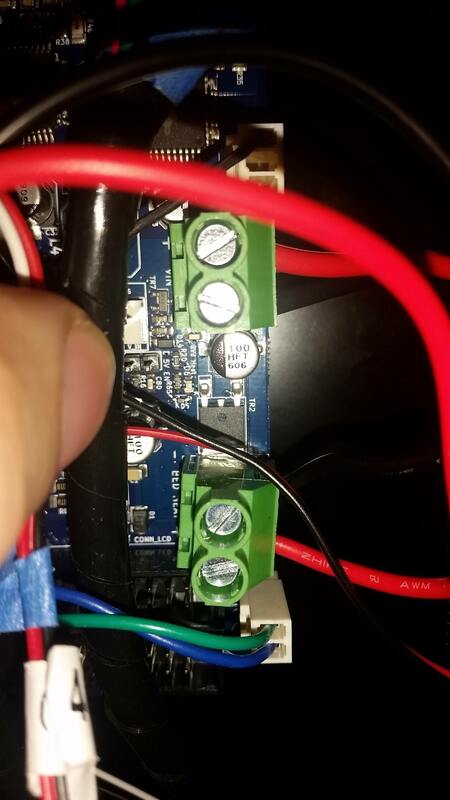 I dug back into my printer to find that the board actually had the markings flipped from what the diagram said, the VIN and ground being switched. I am hoping I did not just completely kill the entire board, but I am guessing it is fried. Figured I'd mention it ASAP before anyone else did the same thing. Hopefully the diagram can get fixed, but I am not sure what to do now. Your link is broken, you have a trailing ). Are you sure you looked at the wiring diagram correctly, and didn't look at the wrong part (like the heated bed polarity)? It looks right to me. Thousands of Duet Wifi/Ethernets shipped to date, if that document was wrong a lot of people would be griping! I was wondering that too, which is why I'm rather confused. This is the picture of the board that I got to compare with the diagram: https://i.imgur.com/KtaatJ7.jpg. Any ideas what's up with that? I can't read that small normally and I figured the diagram would be right. This is in the correct orientation in comparison with the diagram. You can clearly see that the VIN is on the bottom while the ground would be on the top, which means that the diagram would be wrong. No, you're looking at the wiring diagram incorrectly. The wiring diagram is correct and does match your board, your interpretation is incorrect. So you're saying the positive on the board is actually the VIN? I'd think that VIN = VIN and not VIN = GND but fair enough. The VIN is indeed the lower screw terminal on the actual board but the VIN is the upper screw terminal in the diagram, which is what is confusing me, unless that just means the block instead of the lower terminal. That very much so seems plausible. The other thing that confuses me is that if I wired it correctly to the diagram, I would not have done damage to the board. 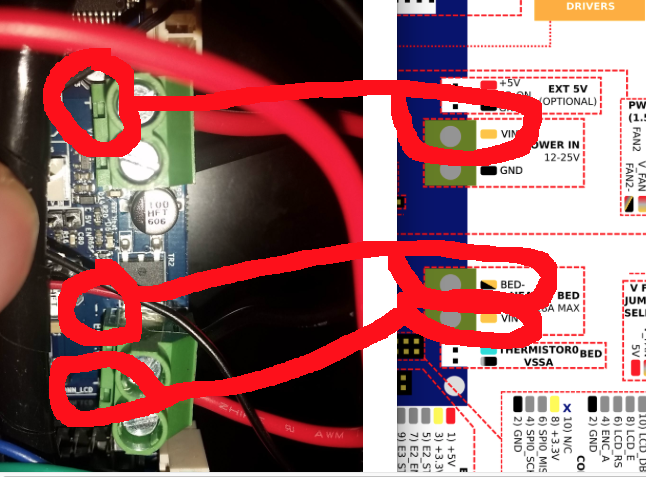 I had my V+ from my PSU to the + on the board and V- to the bottom terminal (GND on the diagram), which was correct with the diagram. Edit: I may have actually had a fault with the board instead which meant that the diagram was not wrong and my board fried when I wired it correctly this whole time. Edit 2: The back of the board has the correct wiring as well, which still confuses me as I did wire it correctly to the diagram and the rear labels on the board. I will try checking my PSU again and swapping the V+ and V- cables and seeing if it works (which it shouldn't). Min has VIN more or less centred on the terminal block but there is a big fat + sign next to the positive terminal. I guess if the terminal block got twisted or was badly fitted, that + sign might get partially obscured. It looks a bit that way in the pic above but that might be camera angle that makes it a bit like a T instead of a +. I can't think of any reason why that would make me wire it differently to the diagram though. The VIN label is for the connector, the screw terminal, consisting of a + (VIN) and - (GND). With the limited space on the board for silkscreen the + is slightly obscured by the terminal (but we did put it on the bottom as well).